たった2つの表面から形作られ、全ての接続部分が一体化しており、それは、やがて座っている人を抱きかかえる内側とそれ以外の部分の外側、2枚の表面がシャープなエッジで出くわす作りになっています。この2つの表面からなる、木工の椅子は非常に少ないと考えられ、新しい試みと言えるものになっています。(INODA+SVEJE) DC10 is an evolution in our works on contemporary furniture with references to both of furniture craftsmanship in a historical sense and modern production with all the possibilities this gives. This chair is either shell nor skeleton it looks like a stick structure but has only two surfaces, one outside and one inside meeting in a very sharp edge. As it has almost become our trademark the sculpturing of surfaces does not stop anywhere so letting your hands wander by the curves in the wood there is continuous shapes to be explored everywhere. 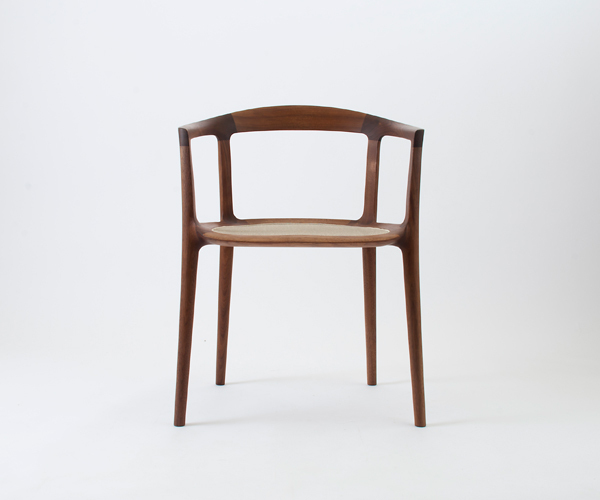 We trust this chair to be a milestone in our furniture design and are curios to see how it will be received.